The Giornale d'Italia reports that as a result of aerial bombardments the garment long venerated as the burial robe of Christ, which has been preserved in a chapel of the Cathedral of Turin, has been taken secretly to a safe repository. Further, the short item said that the Holy Shroud was the personal possession of the royal house of Piedmont and that only the King of Italy, the Crown Prince and the Archbishop of Turin knew the secret location to which the shroud had been removed. In April, 1943, World War II is raging and the handwriting on the wall—if still somewhat fuzzy—is certainly starting to come into focus thanks to the fine optometrists of the Anglo-American invasion forces. Indeed, most of the action in North Africa is about to wrap up: Rommel's Afrika Korps will surrender to the Allies on April 12 in the northern corner of Tunisia. The Germans will then evacuate to Sicily and then to the Italian mainland to begin their agonizing and costly retreat up the boot of Italy. They will block the Allies for long weeks at Cassino, then retreat north to Rome and leave there by early June 1944. The end is just a matter of time, but, still, in April of '43 the Germans and their Italian hosts still hold all of Italy and will remain strong in the north for many months to come. Importantly, RAF air-raids against Turin and Genoa start in October of 1942; thus, the New York Times report seems plausible: protect the Shroud from air raids. Recent accounts of the episode, however, tell a slightly different story. In English, the relic referred to is commonly called the Shroud of Turin; in Italian, la Sacra Sindone; in German, das Turiner Grabtuch; in French, le suaire de Turin. 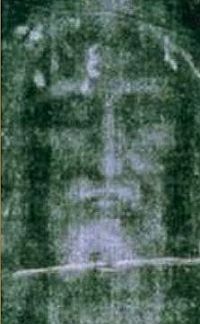 It is the linen cloth (approximately 4.3 x 1 meter/ c. 14 x 3 feet) bearing the image of a man who appears to have been crucified. The shroud is held by some to be the cloth placed on the body of Jesus at the time of His burial. The Shroud of Turin is high on the list of important relics in Christianity. Others include the Holy Grail (the wine chalice used at the Last Supper and to collect blood fallen from the crucified Christ; the Holy Lance that pierced His side on the cross; and many others. On a "lower" level, one finds relics connected with the lives of saints, such as, in Naples, for example, the vial of clotted blood believed to be that of San Gennaro and believed by the faithful to undergo periodic, miraculous liquefaction. Christianity has no monopoly on such relics: There is great veneration for relics among Buddhists, for example, and even the vehemently non-idolatrous faith of Islam shows great deference to the items believed to have belonged to the Prophet Muhuammad that are kept in the Topkapi Palace Museum in Istanbul. And Jews still make pilgrimages to sacred sites and patriarchal tombs; while that may not be veneration, much less idolatry, I've had at least one devout Jew tell me that while he doesn't believe that relics have "power," he would still "tremble a bit" if he thought he were in the presence of the real Ark of the Covenant (the vessel that stored the stone tablets bearing the Ten Commandments). (He smiled when he said that, so will someone who knows kindly let me know if he was joking.) In any event, I express no opinion on the historical authenticity of such things (or even if authenticity matters); I simply note that relics are important to many persons perhaps because—even short of veneration—they provide a concrete connection with faith, a way to render the Unseen visible, and that seems to me a natural thing to need every once in a while. In any event, Rev. Andrea Davide Cardi, the director of the library at the Sanctuary of Montevergine, near Avellino, said in a recent interview that the Shroud of Turin was actually removed earlier than the 1943 date given in the Giornale d'Italia report cited by the NYT. It was removed in 1939 at the outbreak of WWII in Europe, but not to protect it from air-raids; rather, it was moved to keep it out of the clutches of Hitler. 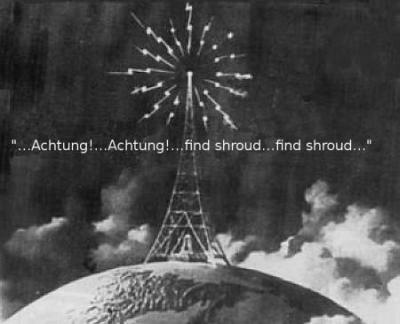 Der Fűhrer had paid a visit to Italy in 1938, and his aides had asked pointed questions about the Shroud. ("Where is it?" "Will it fit in this box?" "What time do the guards take a coffee break?" That sort of thing.) Says Cardin, "the Nazi hierarchy wanted it as a symbol of power, of omnipotence." The secret location was the sanctuary of Montevergine (photo, below) near Avellino, to the east of Naples. Entire libraries have been written about the Nazis and their would-be occult underpinnings. I have no idea if Hitler was demonically possessed, nor do I know if he attributed magical powers to such artifacts or maybe just wanted to keep all good and holy things safe for a while in his Thousand Year Reich. At the very least, if not possessed, he was obsessed with the occult and with religious artifacts. At least a few films have used that theme; admittedly, they have been full of fun rather than fact. Raiders of the Lost Ark is the best-known film of that genre—the thoroughly enjoyable pseudo-oldtime Saturday matinee serial cliff-hanger. Back in real life, Hitler's thugs not only didn't get the girl, but they didn't get the Shroud, either. They found out about the secret stash (just when and from whom is not clear), and with the Allies about to make the jump to the Italian mainland, the shroud raiders decided to look for it in the purported safehouse, the Montevergine sanctuary. Cardin says, "...in 1943 when German troops searched the Montevergine church, the monks there pretended to be in deep prayer before the altar inside which the relic was hidden. That was the only reason it wasn't discovered." The shroud stayed at Montevergine until 1946 when it was returned to the Cathedral of Saint John the Baptist in Turin. The shroud has never been on regular display and is seldom available for public viewing. In hindsight, the choice of the Montevergine sanctuary was a good one. 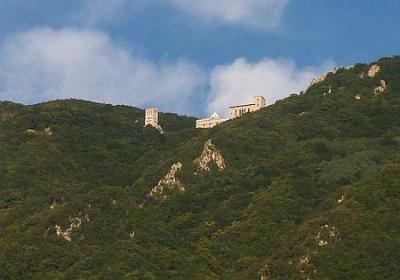 One imagines that other such sites, such as the abbey of Monte Cassino, might have been chosen. That would have been a disaster since that abbey was almost totally destroyed by air raids. Montevergine was not close enough to Naples (the most heavily bombed Italian city in WWII) to actually be on the Allied invasion route or an integral part of the German defensive lines and thus a target. It was not bombed. The only thing I can think of to explain the discrepancy between the NYT/Giornale d'Ialia report and current accounts of the episode is that someone (probably named Kapt. Hans or Fritz) noticed in 1943 that the shroud "never seems to be on display here in Turin. Ver iss it?!" Someone (Guido or Vinnie) said, "Uh, we just now moved it to keep it out of harm's way. But I don't know where they moved it to. Only the king knows. Go ask him. No, the driver doesn't know, either. The king came and drove it away, himself."